Andrew C. Billings is a professor and Ronald Reagan Chair of Broadcasting in the Department of Journalism and Creative Media at the University of Alabama. He is the coauthor of Olympic Television: Broadcasting the Biggest Show on Earth and Media and the Coming Out of Gay Male Athletes in American Team Sports. Jason Edward Black is chair and a professor of communication studies at the University of North Carolina at Charlotte. He is a coeditor of Decolonizing Native American Rhetoric: Communicating Self-Determination, the author of American Indians and the Rhetoric of Removal and Allotment, and a coeditor of An Archive of Hope: Harvey Milk’s Speeches and Writings. They answered some questions for us about their new book, Mascot Nation: The Controversy over Native American Representations in Sports. 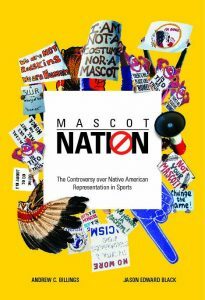 Q: Your book, Mascot Nation, addresses the issue of Native American mascots in sports using both social scientific data and rhetorical/cultural criticism. Why did you decide this joint approach was necessary? There seemed to be two approaches to discussing the mascot debate in this country: (a) mass media surveys about the issue and (b) humanistic approaches to exploring the history and cultural import of the mascot. These two bases acknowledged each other, but rarely worked in tandem. That was our goal here—to infuse both breadth and depth not only methodologically but also by deconstructing the mascot into three parts: names, images, and rituals (three parts of the debate that create a compelling Venn diagram yet with not as much overlap as one would presume). This was a project that neither of us could have remotely conceived on our own because of our own training strengths and limitations. That made it a learning and broadening project for us, too, which we enjoyed. Q: You state that one of your goals in this book is to not to wade into the debate about whether Native American mascots (particularly the NFL team in Washington) should change its name, but to analyze the presumptions embedded in the debate. What are a few of the questions you analyze in this way? There are differences in the constructs people ascribe to these discussions without even knowing it. For instance, if one wants the mascot to change, people have differing opinions on what entity/entities have the power to do so, whether that is an owner, fanbase, players’ union, league, or university. We tried to uncouple some of those presumptions; in doing so, we found for instance, that there is a difference between asking whether a mascot is “acceptable” or “offensive”. Moreover, we found that arguing “should change” and “should have to change” are two different questions. Before anyone can discern answers, we have to figure out how sentiments shift when the language is altered. Q: What was one of the important lessons you learned from analyzing pro-mascot and anti-mascot discourse in Facebook comments? Examining the pro-mascot and anti-mascot language by way of an informal, dialogic social media site such as Facebook presented a number of lessons. The most important lesson, in terms of the pro-mascot rhetoric, was the way that long-standing, centuries-old colonial ideologies concerning Native-U.S. relations clearly found their way into the social media discussions. For instance, pro-mascotters relied consistently on senses of ownership in terms of how they, as fans, ought to be able to decide on a Native American mascot to the detriment of even Native communities themselves. This replicates the ideology of territorial possession that was so important to settler-colonialism from the 17th to 20th Centuries. Now, we see those ideologies moving from colonial control of land, labor, and bodies to 21st Century neocolonial control over Native American symbols. In line with a trove of social media theory, we found that such colonial logics were expressed with very little evidence and reasoning, but rather with vitriol. This demonstrates, as other scholars have noted and as any active social media user may attest, that people are way looser with their words online than they would perhaps be in a face-to-face context. Compared to the qualitative comments from our national survey – most of which made clear arguments – the social media comments focused a great deal on personal attack and incredulity, perhaps due to the less formal landscape that social media allows. Q: What was enlightening about your comparison between University of Illinois’s Chief Illiniwek, which was discontinued in 2007, and Florida State University’s Chief Osceola, which continues to have tribal support? Both fanbases had a sense of wishing to mitigate their cases against more egregiously problematic Native American mascots present in society, particularly the NFL team in Washington. Both bases also believe there was something unique or special about their circumstance compared to others. However, what was most interesting was that the perceived threats that Florida State reported were found to be much smaller when change was initiated in a case like Illinois. Very few fans of the Illini felt their fandom shifted when the change was made while a significant portion of the Florida State fans indicated that such a shift would hurt or change their fandom. Q: Why do you think people should be concerned about the use of mascots in sports? What broader social implications does it have for treatment of Native Americans? The appropriation, commodification, and misuse of Native symbols has been a long-standing tradition in U.S. cultures of politics, economy, popular media, and leisure. Whether used in advertisements (i.e., Redman chewing tobacco; Land O’Lakes butter), parlayed into Hollywood movie caricatures, co-opted through feigned inauthentic rituals of the outdoors (Boy Scouts) and savagery (children “playing” cowboys and Indians), or misrepresented as disappearing cultures therein open to use/abuse of their symbols, Native American communities have suffered from gross stereotypes almost from time immemorial in their contact with settlers. The use of Native symbols as mascots follows in this tradition. Native mascots only appear after the end of the Indian Wars, when Native people were “safely” disciplined and, therefore, made safe for consumption. They were made popular when non-Natives in the U.S., almost Cartesian-like, attempted to sow their less-civilized and more ruggedly outdoor roots in the midst of an industrial age (this is why Braves, Indians, and Warriors became popular Native mascots in the early 20th century). Given that politic, the arguments that mascots respect and honor genuinely fall apart. The question remains: in a universe of natural (i.e., Heat, Thunder), animal (i.e., Bears, Tigers), criminal (i.e., Raiders, Vandals), mystical (i.e., Magic, Galaxy), disastrous (Hurricanes, Cyclones), and past “dead” culture (i.e., Spartans, Vikings) mascots, why would U.S. universities and teams want to make caricatures – in textual, visual, and ritual form – out of living, thriving human cultural groups? Add to this query why marginalized communities specifically should be mascotted and an additional layer of speciousness arises.